John 20:29 “Jesus said to him, Thomas, because you have seen me, you have believed: blessed are they that have not seen, and yet have believed.” Reflection In the past, when I saw this verse, I only thought these were the Lord’s words to Thomas. But several days ago, I saw a passage on the Internet, which made me realize that Thomas represents a type of person and the words spoken by the Lord are also a caution and a warning for us. Share this passage with you: “Thomas represents a type of person who believes in God yet doubts God. They are of a suspicious nature, have sinister hearts, are treacherous, and do not believe in the things that God can complete. They do not believe in God’s omnipotence and His rule, and they don’t believe in God incarnate. However, the Lord Jesus’ resurrection was a slap in the face to them, and it also provided them with an opportunity to discover their own doubt, to recognize their own doubt, and to acknowledge their own treachery, thus truly believing in the existence and resurrection of the Lord Jesus. What happened with Thomas was a warning and a caution for later generations so that more people could warn themselves not to be doubting like Thomas, and if they were, they would sink into the darkness. If you follow God, but just like Thomas, you always want to touch the Lord’s rib and feel His nail marks to confirm, to verify, to speculate on whether or not God exists, God will forsake you. So, the Lord Jesus requires people to not be like Thomas, only believing what they can see with their own eyes, but to be a pure, honest person, to not harbor doubts toward God, but only believe in and follow Him. This type of person is blessed. This is a very small requirement the Lord Jesus has for people, and a warning for His followers.” After reading these words, I understand the reason why the people such as Thomas have failed. It is because that their hearts are too deceitful. They always assess the authenticity and reason of things with their own eyes, clinging to the view “seeing is believing,” and do not have the eagerness to seek the truth, this kind of people finally are ruined by their deceitfulness. Now we all yearn for the second coming of Jesus, but many people believe that the Jesus who does not ride upon a white cloud is a false Christ. No matter who testify that the Lord has returned, they do not believe and cling to their own conceptions and only believe when they see the Lord come openly on clouds with their own eyes. Don’t they have the same viewpoint as Thomas? If we hear someone preaches the Lord has come, we don’t put aside our imaginations and conceptions, or follow the masses, waiting and seeing, or hesitate to seek and investigate the true way, we are surely unable to see the Lord’s appearance, thus we’ll lose the opportunity to gain salvation and enter the kingdom of heaven. The Lord said, “Because you have seen me, you have believed: blessed are they that have not seen, and yet have believed.” These words are just the Lord’s reminders of us so that we won’t follow in the footsteps of those who had failed. » Read more in these articles: • 3 Truths About the Resurrection of Jesus Christ We Should Know • Lessons From the Lord Jesus’ Appearance to Thomas the Apostle • Do You Know the Real Meaning of Easter? Peace be with you all! Dear brothers and sisters, if you have any understanding or enlightenment from God, you’re welcome to share with us.1. Via the online chat window at the bottom right corner of the screen.2. Send an email to info@testifygod.org.We sincerely hope we’ll grow spiritually through sharing with each other. Proverbs 9:10 “The fear of Jehovah is the beginning of wisdom: and the knowledge of the holy is understanding.” Reflection Who is wise? Who is foolish? We often use intelligence and life experience to measure whether a person is wise or not. But the verse indicates that wise man seeks knowledge of God. 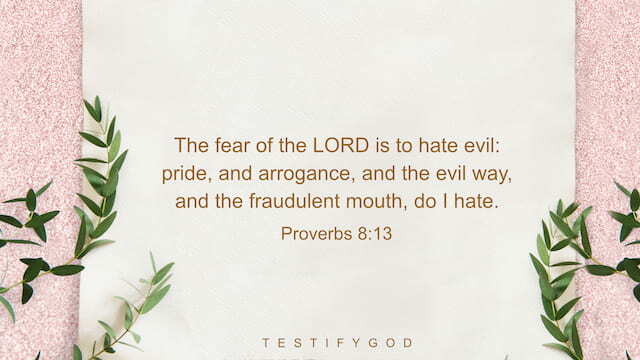 If you want to obtain wisdom, you must fear God. And why? For the source of wisdom is actually the Lord who created the heavens and earth and all things. The story of King Solomon in the Bible is a very strong evidence. He asked for wisdom from God, with which he solved a dispute over infants between two mothers. His fame had spread to other places, even the Queen of Sheba heard of his fame and visited him with hard questions. After seeing his wisdom, she gave precious treasure to him. The kings all over the world asked to see Solomon and hear his wisdom gifted by God. It is also written in the Bible, he was wiser than all men. It can be seen that God is the source of wisdom and showed His great power in King Solomon! It shows that the person who knows to rely on God is a wise man! Pray to God, rely on God and obey God’s arrangements in all things, then from experience you definitely see how God arranges everything for you and how wise He is. » You may be interested in reading more: • Daily Reading: The Samaritan Woman’s Wisdom • Daily Bread – The Significance of God Giving Adam Wisdom • 70 Bible Verses About Wisdom Peace be with you all! Dear brothers and sisters, if you have any understanding or enlightenment from God, you’re welcome to share with us.1. Via the online chat window at the bottom right corner of the screen.2. Send an email to info@testifygod.org.We sincerely hope we’ll grow spiritually through sharing with each other. Proverbs 7:1 My son, keep my words, and lay up my commandments with you. Reflection God says, “Walking in God’s way is not about observing rules on the surface. Rather, it means that when you’re faced with a matter, first of all, you view it as a circumstance that has been arranged by God, a responsibility bestowed on you by Him, or something that He has entrusted to you, and that when you’re facing this matter, you should even view it as a trial from God. When facing this matter, you must have a standard, you must think that it has come from God. You must think about how to deal with this matter such that you can fulfill your responsibility, and be faithful to God; how to do it and not infuriate God, or offend His disposition. … There are often those who believe that the matters which aren’t paid much heed by people, the matters that aren’t usually mentioned—these are merely minor trifles, and they don’t have anything to do with putting truth into practice. When these people are faced with just such a matter, they don’t give it much thought and let it slide. But in actual fact, this matter is a lesson for which you should be studying, a lesson on how to fear God, on how to shun evil. Moreover, what you should be even more concerned about is knowing what God is doing when this matter arises to face you. God is right at your side, observing every one of your words and deeds, observing your actions, your mind changes—this is God’s work.” God’s words are well put. No matter what we encounter, whether it is a big matter or a small matter, it is meticulously arranged by God. God is watching us whether we follow the way of fearing God and shunning evil. As a believer of God, the most fundamental step is to act according to God’s words, seek His will in all things but not to follow our own will. This is what a qualified Christian should do. » Recommended for you: • 4 Steps to Magnify the Lord in Your Life – Daily Practice • Obey God’s Sovereignty, Live Out the Real Human Life • Bible Verses About Obedience Peace be with you all! Dear brothers and sisters, if you have any understanding or enlightenment from God, you’re welcome to share with us.1. Via the online chat window at the bottom right corner of the screen.2. Send an email to info@testifygod.org.We sincerely hope we’ll grow spiritually through sharing with each other. Proverbs 8:35 “For whoever finds me finds life, and shall obtain favor of the LORD.” Reflection We understand that God is the truth, the way, and the life. You have searched for God, of course you find the source of man’s life. God’s words say, “Perhaps, now, you wish to receive life, or perhaps you wish to gain the truth. Whatever the case, you wish to find God, to find the God that you can rely on, and who can provide you with eternal life. If you wish to gain eternal life, you must first understand the source of eternal life, and must first know where God is. I have already said that only God is immutable life, and only God possesses the way of life. Since His life is immutable, so it is eternal; since only God is the way of life, so God Himself is the way of eternal life. As such, you should first understand where God is, and how to gain this way of eternal life.” Nowadays, numerous Christians desperately yearn for the return Lord Jesus and truly wish to gain the eternal life. Then how can we gain the eternal life? » Read more on our Eternal Life page, or click on the related articles below: • What Does Obtaining Eternal Life by Believing in the Son Mean? • What Is the Way of Eternal Life and How Can We Gain It? • I Finally Know What Is Eternal Life and How to Get It Peace be with you all! Dear brothers and sisters, if you have any understanding or enlightenment from God, you’re welcome to share with us.1. Via the online chat window at the bottom right corner of the screen.2. Send an email to info@testifygod.org.We sincerely hope we’ll grow spiritually through sharing with each other.